^ Wilson AW, Binder M, Hibbett DS. eEffects of gasteroid fruiting body morphology on diversification rates in three independent clades of fungi estimated using binary state speciation and extinction analysis. Evolution. 2011, 65 (5): 1305–1322. PMID 21166793. doi:10.1111/j.1558-5646.2010.01214.x. ^ Persoon CH. Synopsis methodica fungorum. 1801. ^ G. W. Martin. The Starting Points for Fungi (PDF) 0 (1). Taxon. 1960 [2018-09-15]. （原始内容存档 (PDF)于2018-09-15）. ^ V. Demoulin, D. L. Hawksworth, R. P. Korf and Z. Pouzar. A Solution of the Starting Point Problem in the Nomenclature of Fungi 30 (1). Taxon: 52-63. doi:10.2307/1219390. ^ Fries EM. Systema Mycologicu. 1821. 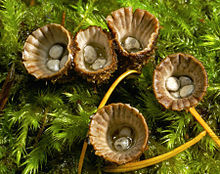 ^ Hibbett DS, 等. Evolution of gilled mushrooms and puffballs inferred from ribosomal DNA sequences. Proceedings of the National Academy of Sciences. 1997, 94 (22): 12002–12006. PMC 23683. PMID 9342352. doi:10.1073/pnas.94.22.12002. ^ Kruger D, 等. The Lycoperdales. A molecular approach to the systematics of some gasteroid mushrooms. Mycologia. 2001, 93 (5): 947–957. JSTOR 3761759. doi:10.2307/3761759. ^ Binder M, Bresinsky A. Derivation of a polymorphic lineage of gasteromycetes from boletoid ancestors. Mycologia. 2002, 94 (1): 85–98. JSTOR 3761848. PMID 21156480. doi:10.2307/3761848. ^ Miller, 1988, pp. 36–47. ^ Dring DM. (1980). Contributions towards a rational arrangement of the Clathraceae. Kew: Royal Botanic Gardens. Miller HR, Miller OK. Gasteromycetes: Morphological and Developmental Features, with Keys to the Orders, Families, and Genera. Eureka, California: Mad River Press. 1988. ISBN 0-916422-74-7.